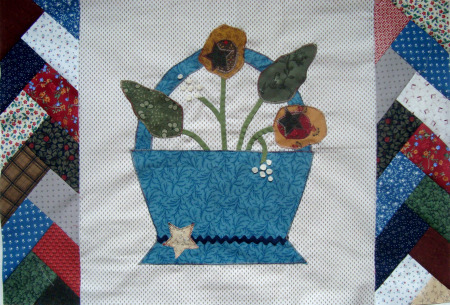 Today is the 1st Border for the Patchwork Round Robin!!! I decided to try the braided border for the 2 sides. They are 4 1/2 inch X 16 1/2 inch long. You will be making 2 of these. * Add a second rectangle to the other edge. * Continue adding 2 strips to the sides. You will find that your pieces will be longer than the side you adding it onto…that is correct! Those little points will be cut off when you are squaring it up when finished. 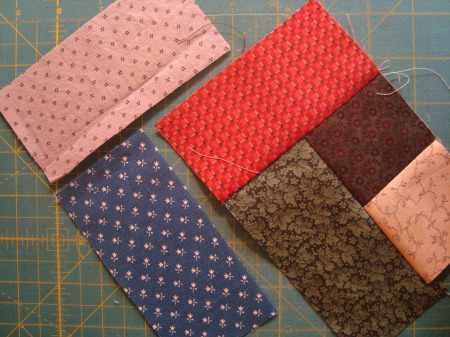 * When you have sewn all of the rectangles to the 2 strips you will need to trim it to size. Lay your ruler along the long edge –just before all the points start. Make sure you are cutting enough off. Trim and repeat with other strip. * Lay the ruler along the straight edge and measure 4 1/2″ wide. Trim this edge. 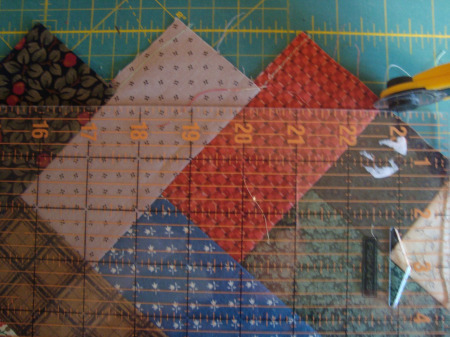 * Lay the ruler along the short edges and make the rectangle 16 1/2 inches long. 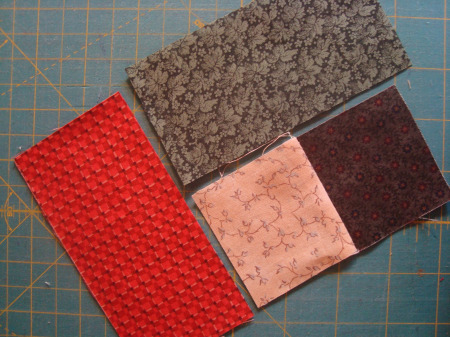 * Pin to the block and sew to 2 sides of the block. Cute huh? pst— are you following along? Share your photos with the rest of us!!! pst-pst– Want your name on the sidebar or would you like to design a side? Let me know! pst-pst-pst— Did you know this is a free pattern? and it is a great pattern for beginners? That means you should join us!!! pst-pst-pst-pst– Do you need the center block? Go here.